DWTS 14 End-of-Season Awards – Which Celebrity Improved the Most? Courtney: I don’t think this season’s “most improved” award was quite as clear for me as it’s been in previous seasons – I know when I voted in season 12, it was like “Duh, ROMEO!” and in season 13, “Of course it’s Rob!! !” This season, I found myself wavering a bit, as it seems like a lot of people started out being good and then stayed pretty good the entire season – and then there were others who were a bit up-and-down. In the end, though, I think the improvement was most apparent with Maria. I remember muttering “Yikes!” after her cha-cha in week one, as she looked downright terrified and pretty unsteady on her legs. Then she looked a bit more relaxed and in the zone in week 2, and a little more in week 3, etc. By the time classical week rolled around and she managed to get the first perfect 30 of the season, I was pretty impressed. As for Donald – I do think he improved, but it wasn’t quite as marked as Maria – plus he really never seemed to get the love he deserved from the judges, so I guess it kinda distorted things for me. It became a matter of “Is he really improving drastically, or are the judges just finally warming up to him?” I will credit Melissa with improving in her stage presence, but overall, I think her dancing only improved slightly during her stint on the show. I think Gavin could have improved quite a bit, had he stuck around a little longer – but his transformation in the short time he was on was enjoyable nonetheless. 🙂 I feel the same about Roshon as I do about Donald – I don’t know that he was truly improving (I thought he was pretty good the whole season), but the judges just seemed to vacillate between lavishing praise upon him and absolutely ripping him to shreds from week to week, so I think it gave a false impression of him having all of these dramatic ups and downs. I thought Gladys gave it a good try, but only had a slight net improvement throughout the season; I thought Jaleel was down more than he was up; and I still don’t think I even saw enough real dancing from William to even determine if he improved greatly. I think his finale cha-cha looked better than his week 1 cha-cha, but that’s the only benchmark I have to compare to. Vogue: Court, I’m with you again. When I first read this Poll, I was baffled for who to vote for “most improved”? With every season we’ve done this, I usually know straight away for who to answer with, but, not this time. After thinking on it, I voted for Maria. Looking back to her first interviews and first dances, she was weak and a little uncoordinated. She so nervous and unconfident. She was worried she wouldn’t be as good as Derek’s other partners which she voiced several times in interviews which, in turn, made me nervous for her too. Well, just like Derek said, he worked on her “walk” first. After that, he totally molded her into a confident dancer. Soon, we saw her relaxing and them playing off of each other’s humor and creativity. His Fox totem was hard at work and in tune again. He can “blend” into anyone to make a union work. It amazes me how he can do that season after season. It’s too bad Jack Wagner was sent home so early. I think he could have improved more with every show too. Heidi: Yeah, I’d go with Maria. The problem with this category is that you pretty much have to totally tune out the judges nonsense and the crowd reaction to get to the heart of what is real – that’s very hard to do. Roshon started out good and stayed good – but it’s easy to think there is actual improvement when one week the judges are saying how poorly you did and the next week they are raving. It’s very easy to hear all that “noise” from them and have it start to sink in. As for Donald? The judges never liked him, IMO, and never “wanted” him to win (I think in the end their rank comes out in the scoring regardless), so when they finally started giving him credit it was like an epiphany. “Oh, he’s improving! !” Well, maybe – but not as much as Maria. The judges own bias turns into noise, which turns into false impressions for a lot of the dancers. But I think Maria truly went from “Bambi on ice” (per Derek) to a decent dancer. She’s not the best of his partners in terms of dance quality, but I think she did go the farthest in terms of growth. DWTS 14 End-of-Season Awards – Which Couple’s Elimination Was the Most Disappointing? Courtney: This is always an interesting category, because I think certain people interpret it in different ways – some people seem to vote for the most shocking elimination, some people vote for their favorite couple (because it would stand to reason that their elimination probably would be the most disappointing in their mind! ), some people vote for someone in the finale that they felt they didn’t place high enough. *shrug* To each his own. I guess I tend to vote for the couple whose elimination seemed to illicit the greatest emotional response in me – and I think that often gets colored by how that couple fares throughout the season. My knee jerk reaction with this one was Roshon & Chelsie, but then I realized by the time they got sent home that they had been beaten up so badly by the judges week to week that I was almost relieved that they weren’t going to have to endure it any longer, and I wasn’t going to continue yelling at the tv in frustration. I was kinda sad to see Gladys go, for the simple reason that I thought they really kinda screwed her in the end; I was disappointed to see Maria & Derek go, because I thought they could have delivered a much more entertaining performance in the finale than William & Cheryl. But in the end, as surprising as this may sound, I think I was actually most disappointed to see Jack go – because at that point in the season, I wasn’t totally jaded by all the fishy stuff the judges were doing, and I thought Jack was one of the stronger male dancers in the competition and I wanted to see more from him. I guess by the time Roshon & Maria’s eliminations rolled around, I was kind of “whatever” about this season as a whole, so it didn’t bother me quite so much – but I was definitely upset by Jack’s earlier ouster. Vogue: My feelings in this category stumped me too. I thought this award would go to Roshon all season, but, he actually stuck around until the right time despite how harsh the judges were on him all season. In the end, it was a toss up between Martina, Jack, and Sherri. Who did I pick? Sherri!! Yes, Sherri. At first I had my misgivings with all the cheating stuff and then she started wrapping me around her finger with how funny and compassionate she was about learning how to dance. She was so into it all. When she cried during her elimination, I cried too. She was so thankful to her fans and the experience. I also loved it when she said to take on the things you are most scared of and how that can make you the happiest in this life “on the other side”. Remember that? I melted. I was sad to see Jack go as well because there was potential there and he was just an all around nice guy. I would have liked to have seen his message about adoption and finding his daughter played out more. Then there was Martina. I was really hoping to see a retired tennis champ and one of my tennis mentors really take over the dance floor “mentally” somehow like she did tennis and her competitors somehow, but, I was more disappointed in Tony than in Martina. I will always wonder if she had another partner, would she have done better? Maybe not? DWTS 14 End-of-Season Award Winners – Which Dance Was the Worst? Vogue: As much as I hate to admit it, the voters in this Poll pegged it. Being I was a huge tennis fan of Martina’s, I was really hoping she’d stun the dance world like she did her tennis days back in the day. But, oiy,…as soon as I saw her costume for the Jive, I cringed and could foresee her fate. From there, it just got worse. I felt so sorry for her. It wasn’t like she was trying. Like Court, I blamed Tony for the costume. This dance was proof positive how a costume can set the tone. Even still, she was lagging in time. It was sad and painful to watch. She knew it was bad too. As for the other dances, I was shocked (yes, I am pathetic) to see Jaleel and Kym’s Shaft dance have the outcome it did. I wasn’t a fan to Jaleel all season, but, the Shaft dance actually made me smile and laugh. I liked how it kind of poked fun of him. It was so “him” too. Heidi: How can you NOT blame Tony for the costume since he’s the one that repeatedly uses that type of costume on his partners? Take a look back at some of Melissa’s dances with him. At least it was better on her. I think Martina looked in the mirror and could no longer focus on dancing because of that horrible costume. Horrendous. Gawdawful. Worse than the dance even. As for William – yeah, he wasn’t a horrible dancer, but he was also not the best thing since Gilles like they promoted him – and I laugh every time I see that Jive too. 🙂 Of course, it gave Cheryl something to blame and she ranted about that shoe to anyone who would listen for days afterward. As for the other write ins – why take the time to write no comment or no bad ones?? And I also think that anyone who writes in Maria or Katherine is someone with an axe to grind. Disgruntled William fan? 🙂 Same goes for Sherri and Val’s dance, actually. Worst?? With Martina in the running? Right. Courtney: Can’t say I’m too surprised at the results – the two that I predicted would do well ended up on top, and the rest got a small share of votes, likely from diehard fans of that particular couple. I do think the jive trio was the dance of the season – the fact that they took a dance that was hard to do with only 2 people and managed to create something fun, energetic, and proper with 3 people was beyond impressive to me. And the fact that they DIDN’T get a perfect 30 for it??? APPALLING. I seriously think people don’t realize how HARD it is to lead 2 women – and Donald’s the only one that took on that challenge in his trio dance, and he KILLED IT. I didn’t see Roshon or William trying to lead two ladies. Maria & Derek’s paso was good – for this season. I just can’t seem to get too excited about it, though, because it just wasn’t up-to-snuff with the paso choreography I’m used to seeing from Derek. As for all the other responses – I think they all were those couples’ best dances, but probably not the best dance of the season. Write-ins? It’s the usual smorgesbord of random dances, and I usually find myself shaking my head reading some of them, and saying “Really? You REALLY think that was the best dance?” But alas, different strokes for different folks. 🙂 The only one I’m gonna comment on is Donald & Peta’s freestyle…and I guess Katherine & Mark’s, too. I always shy away from including those as options in the “best dance of the season” category, because it seems that, unless a couple REALLY picks a dud, it’s a dance that most couples do well with, and the scoring is pretty inflated – it almost seems like too much of a gimme. That said, I did really enjoy Donald’s freestyle – but I didn’t think the level of difficulty was as high as his jive trio was. And I thought Katherine showed better endurance in her jive than in ther freestyle. Vogue: Court, you took the words out of my head this time. 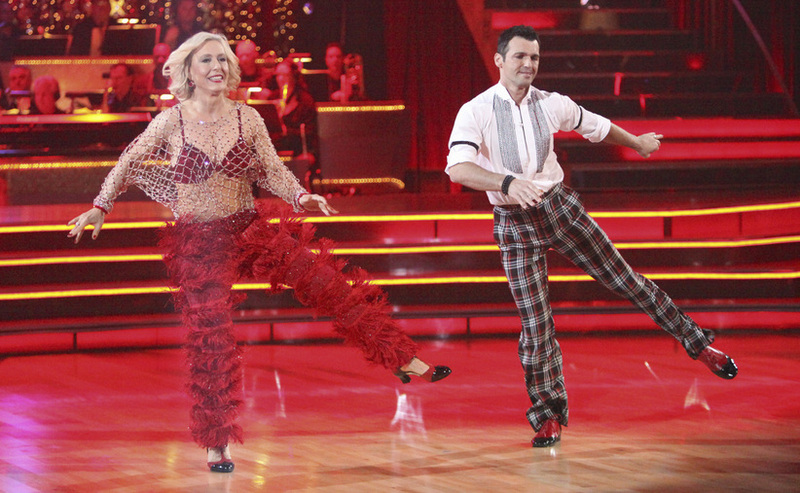 My favorite dance of the season (and the dance I thought was the best) was Donald and Peta’s Jive trio. Donald’s fast leg and footwork amazed me at the time. So much so, I screamed to my husband in the other room to come watch (and we had to replay it after the show several times …which I don’t ever remember doing with him as long as I’ve been watching this show). Our mouths literally dropped to the floor especially when Donald jumped over the top of both girls. 😯 A blow away for me as well was their Freestyle. I also loved their Paso Doble and Argentine Tango with the amusement ride twirl. Other stand out dances for me that I thought were the best were Derek and Maria’s Bollywood Trio dance and Paso Doble. Looking back now, I will remember Derek and Maria’s Bollywood Trio dance the most of their dances even though it probably wasn’t her best dance technically, but, it was different, so creative, theatrical, and entertaining. Another dance I have to give props too is also William and Cheryl’s Argentine Tango. I loved all the passion in that dance. William was so into his character and I loved his tails which is when he looked the sexiest in my opinion. 🙂 Anyway, great poll and results!! Vote for Your Favorites in the PureDWTS Season 14 End-of-Season Awards!!! Ok kids, it’s time once again to vote of our biannual “end-of-season” awards…our sort of “wrap up” for season 14, where we see what you guys think were the highs and lows of this season 🙂 If you want to get a feel for how these awards work, you can check out previous seasons’ award recipients here. For another chance to win the next Mirror Ball! To help us introduce this post, above is a Dancing With The Stars finale poem written by PureDWTS reader Lois gearing us up for tonight. Perfect Lois!! Thanks! Also, if you haven’t been following Sherri Shepherd at twitter, be sure you are as she has been tweeting some fun pictures of the cast rehearsing for this week’s finale dances. Below are just a few of them. Be sure to check out her twitter account here for more. 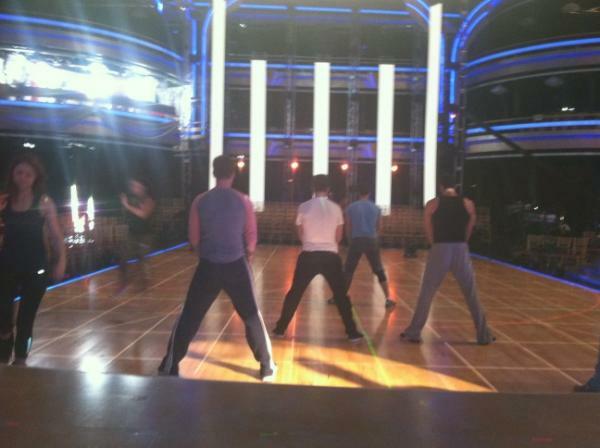 ADDING: TV Guide has a cool commentary up today of what to watch for in tonight’s dances on Dancing With The Stars. They also run through each couples strengths and what they need to work on. Below is what they wrote for Donald Driver. You can read more of what they wrote for Katherine and William at the link. For Him : Charm, Packer Nation and sympathy. Despite a handful of strong and dynamic performances, the judges have been underscoring Driver. 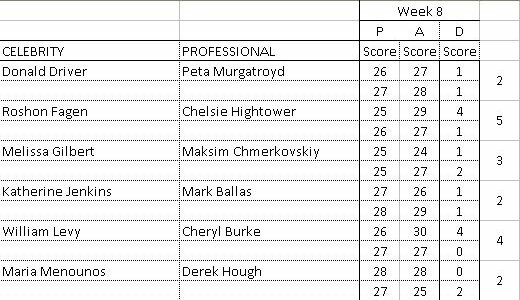 He also arguably deserved his long-desired perfect score of 30 two weeks ago for his jive trio, but Len Goodman continues to hold back the 10 paddle while over-scoring some other pairs. The underscoring has angered a lot of fans and has not gone unnoticed by the pros. Needs to work on: Getting out of his own way. Driver’s so desperate for a 30 that he sometimes goes into overdrive (no pun intended) when he dances, which causes him to either slip up or tighten up. Forget about the triple 10s and just dance! If you perform it, they will come. Why he might win: He’s a better dancer than both Katherine and William; he’s technically sharp and an electric crowd-pleaser. His own eight-pack also doesn’t hurt and neither does his massive Green Bay Packers fan base. Plus: The fact that he’s been a diehard Dancing fan since the first season — and is not doing this to shill something — is surely endearing to viewers. Football players have a great record on the show too, but while there have been many who have made it to the business end of the season, only two have won: Emmitt Smith and Hines Ward. Could Driver be the third? Watch out for: His freestyle. We all know that’s the make-it-or-break-it dance, and the pressure will be on his partner Peta Murgatroyd, who’s untested in her first final in two seasons against two two-time winner pros, to deliver a routine worthy of Quickie’s talent. 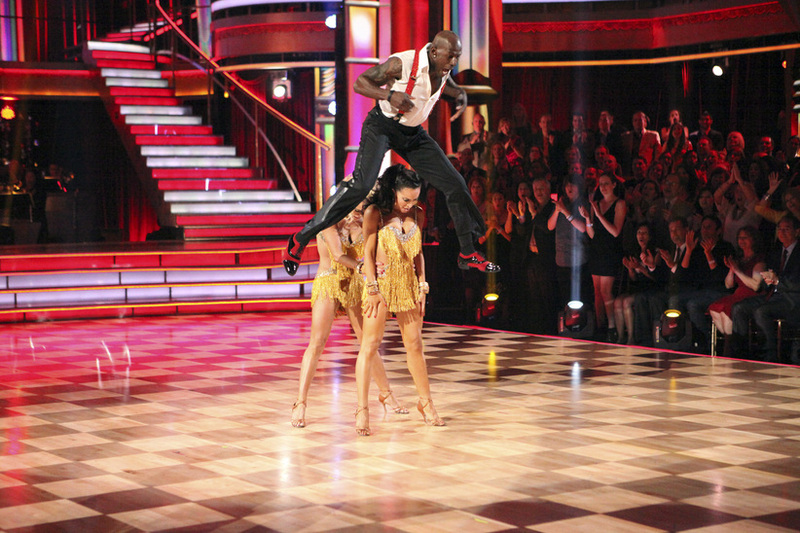 DWTS Season 14, Week 9 – The Cheesecake Awards!! We’re back, after a couple week absence…and some of you will not be happy to see us. 😉 Them’s are breaks…the weeks we missed we’ll pick up as a bit of retrospective cheese once the season is over. Heidi: You might ask yourself, “Are ‘biggest’ and ‘lack’ really the two best words to put together?” but really that was what was going through my mind looking at her costume. Yo, dudes, either add the fringe or don’t – you kinda half assed it here, IMO. 🙂 Yep, we’re picking nits. Courtney: Everything about the show this week was so…blah. Most of the routines were ho-hum, nobody really said anything interesting, and even the costumes seemed like they were half-assed. It was as if the costume folks bailed and headed to the bar after only putting half the fringe on her costume. “Yeah, that’ll do. C’mon, we can make it for happy hour if we leave now!” Can’t blame them…even I’m bored with the show at this point. Heidi: Really, dude. You’ve put Katherine in two cages and Bristol in one…is this a comment on how your attitude toward women in general or these two women in particular? 🙂 Or is it just a sexual kink all the way around? 😉 Considering your girlfriend, I’m going with BOTH. 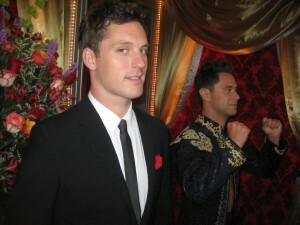 The Dancing With The Stars Make-up Team at Facebook has released loads of new photos from behind the scenes of week 8. Below are just a few. I’m always reminded of how much work goes into this show besides just dancing and how many people are involved. Be sure to see the link to see the full album. If you’d like to see the full size of the pictures below, click them. Stunning! Stuart Brazell And Elena Grinenko of Dance Junkies TV talk of the importance of technique and if the judges Know what they are talking about. If you missed Part 1 of this series, be sure to see it here. Elena gets as frustrated as we do sometimes when the judges “pick” at the couples. Since Week 8 is a double elimination week, I felt that it would probably benefit everyone if I went ahead and did a scorecard for this week and probably will continue to do so for the last two weeks of the season thereafter. Before we start, the very last column is just the summation of the differences between the two dances that each couple has to dance.